Interested in receiving a quote or would like more information about our facilities? Are you planning a wedding or special event that will create memories of a lifetime? Please fill out the form below, and we will respond to you shortly to discuss the details and assist you in all aspects for your special day! 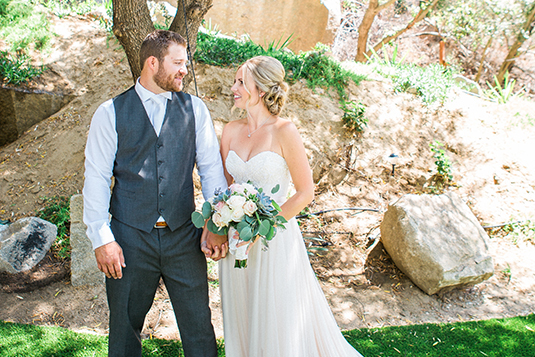 Tucked away in a secluded canyon, the wedding grounds and quaint cottages date back to the early 1900s when the area served as a granite quarry. Today, instead of sheltering quarrymen, the cottages and surrounding stone-and-granite tiers offer a quiet getaway and an opportunity to have a romantic wedding, birthday, or family reunion. As they arrive, your guests are offered a chance to mingle on the property in between the wedding lawn and the reception area. This area is filled with large oak and almond trees that provide shade and ambiance as they await your event. All of this is set against a mountainside background of natural scrub oaks and smattering of granite boulders. The bride is offered a private cottage to relax and prepare for her special day right on site. 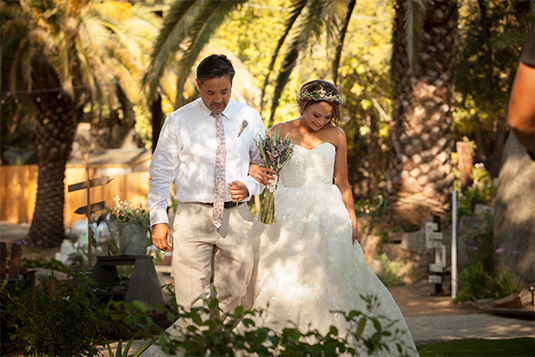 As the ceremony begins, she makes her grand entrance past huge granite boulders and up the aisle to a beautiful wooden arbor, sandwiched in ancient granite boulders while exchanging vows under a canopy of oak trees and hanging lights. While the bridal party takes final pictures, the reception area is prepared and cocktails served just feet away. Local oak wine barrels are used as tables to add a nice wine country touch. Dinner follows immediately at the reception area with a view of the wedding lawn and market lights in the oak trees. Aside from the natural beauty, the property offers wedding and event coordinators the chance to create their vision. While the adults are dancing, the kids can often be seen roaming the property or playing a game on the wedding lawn. In-house wedding coordinator. Here to guide you before and during your special event. Making sure you’re informed and presented with ideas and advising you where to splurge to maximize your vision. Helping you with all the details, organization, floral displays, food, and entertainment choices. Getting the best estimates possible, and most importantly, getting everything within your budget.